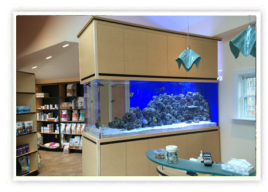 It is widely known that observing fish and other saltwater aquarium species is a great way to ease stress, which is why so many doctors, dentists, and therapists throughout Connecticut maintain aquariums in their offices. Besides easing stress and contribute to lower blood pressure of adults, it has also been known to keep overzealous children calm by creating a feeling of nature in a residential home or professional office. Normal Aquatics has installed many custom aquariums in professional offices and residential homes throughout the Fairfield County Connecticut and New York City area, and most of the questions and concerns that we receive from our clients involves the difficulty in setting up and maintaining the aquarium. We want our clients to understand that setting up a saltwater aquarium will require some patience and there are some factors to consider before we begin installation. We have compiled a list of some of the more important components of salt water tank installation, which you should examine. The first step you should take is selecting a location, size, and type of stand for your aquarium. We recommend that you choose a location that does not receive a lot of natural light. Direct sunlight can create large amounts of algae, which can wreak havoc on your saltwater aquarium. You must decide on the size of the aquarium you would like installed and then make sure that you have enough space in the room to accommodate your tank. If this is your first saltwater aquarium, we suggest choosing an aquarium that is at least 55 gallons because with smaller aquariums, it is more difficult to maintain your water quality and develop working balance within the tank. You can hire Normal Aquatics to install a custom aquarium to make the most out of the space you are working with. Glass vs Acrylic. Once you have decided on the size and location of your aquarium, you must then choose on whether you would like an aquarium built on using glass or acrylic. Glass has been favorite of many aquarists throughout Connecticut because it is harder to scratch and will therefore stay clear for a longer period of time and in most cases will cost less than an acrylic tank. However, because of the way acrylic is molded, it can be formed into multiple shapes and contours, which will give you a lot less limitations when building a custom aquarium. Normal Aquatics offers free consultations, so you can contact us at anytime to further discuss whether glass or acrylic would be more suitable for your aquarium. Choosing Aquascape for your aquarium. The most exciting part of your new saltwater tank installation is creating and underwater landscape filled with plants, corals, reefs, decorations, and fish. It is important to start off with aquatic decoration as centerpiece of attention for your tank. You can then use smaller ornaments to enhance and and complement the centerpiece. Normal Aquatics has many years of experience in designing and creating beautiful custom aquatic landscapes. We recently designed an aquatic landscape for one of your clients in Greenwich, Connecticut. 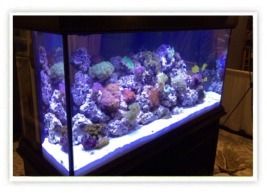 You can head over to our custom aquarium photo gallery to view this project and many more. Normal Aquatics provides custom tank installations, aquarium maintenance and repair, and custom pond installations. Our service area includes the following towns and surrounding areas Fairfield Connecticut, Greenwich Connecticut, Westchester County New York, White Plains New York, New York City, Northern New Jersey, and all of New England. Contact us today for a FREE Consultation!